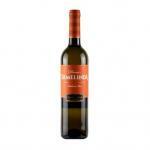 Casa Ermelinda Freitas produces the Dona Ermelinda White , a white wine from Setubal that is based on fernao pires, chardonnay, antão vaz and arinto grapes. Uvinum users evaluate this white wine with 4 out of 5 points. What's the evaluation of the Dona Ermelinda White?